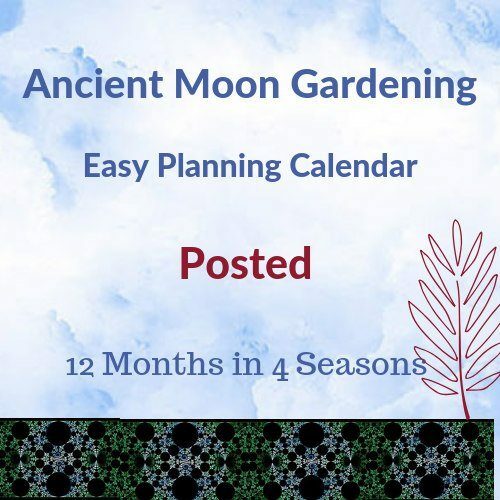 Ancient Moon Gardening, or Lunar Gardening, is a way of aligning ourselves with Mother Nature for harmony with the earth, and this leads to productive crops and increases both the beauty AND our appreciation of gardens and care of the land. It is an ancient technique that is simple and easy to use. Following the Moon gives us the days to plant, prune for growth and to prune to limit growth, harvest, treat pests, feed and weed, even when to have haircuts and colours and the days to work and the days to rest. It combines the Moon Phase with Fertile and Barren Moon Signs and is easy to use; and it works! 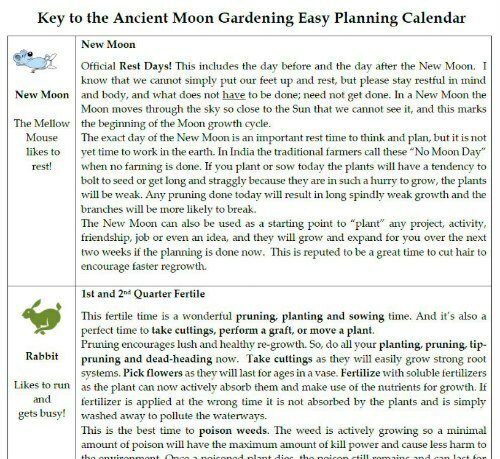 I have produced a moon gardening calendar for everybody who wants to gain harmony with the earth from the enthusiastic amateur to the serious crop producer. When you are in harmony by working with the Moon you can see Mother Nature at work, do less and accomplish more, and best of all… nature and your garden thrives! the days to prune to limit growth – great for lawn mowing, hedges, bonsai etc. the days to weed by poisoning – so that a very small dose of spray works! the days to have haircuts and colours! Be in harmony with nature, have beautiful lush gardens, increase crop productivity, save money when plantings survive, and do it all easily. The Ancient Moon Gardening Easy Planning Calendar is an easy to read one page per month calendar. All dates and time are in Australia AEST. The Moon position is from the Swiss Ephemeris in Solar Fire Esoteric Technologies. It is only $31 emailed or posted (plus postage costs) – for the whole year! 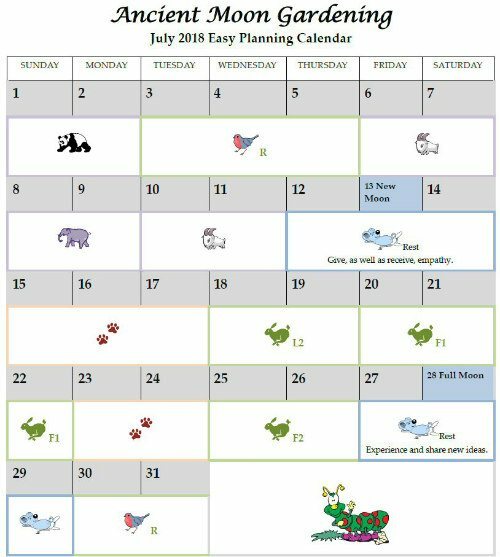 Please note: the moon calendar is only available via post to those from Australia and New Zealand due to postage costs. 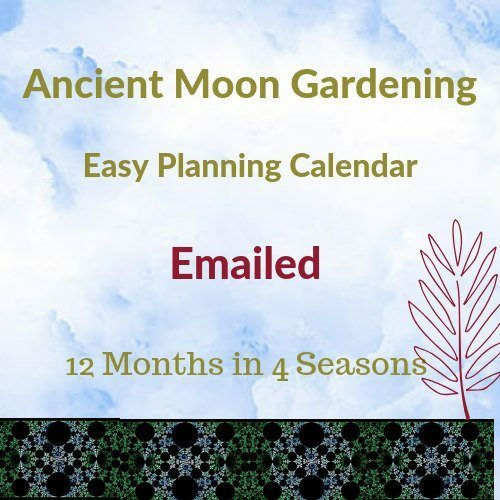 Those interested in strengthening their connection with the nature and the land, and in sustainability, will be keen to learn how to use the moon’s lunar cycles. My aim is to show you how to understand the rhythm of nature and increase awareness of our deep connection to the very earth that nurtures and supports us all. 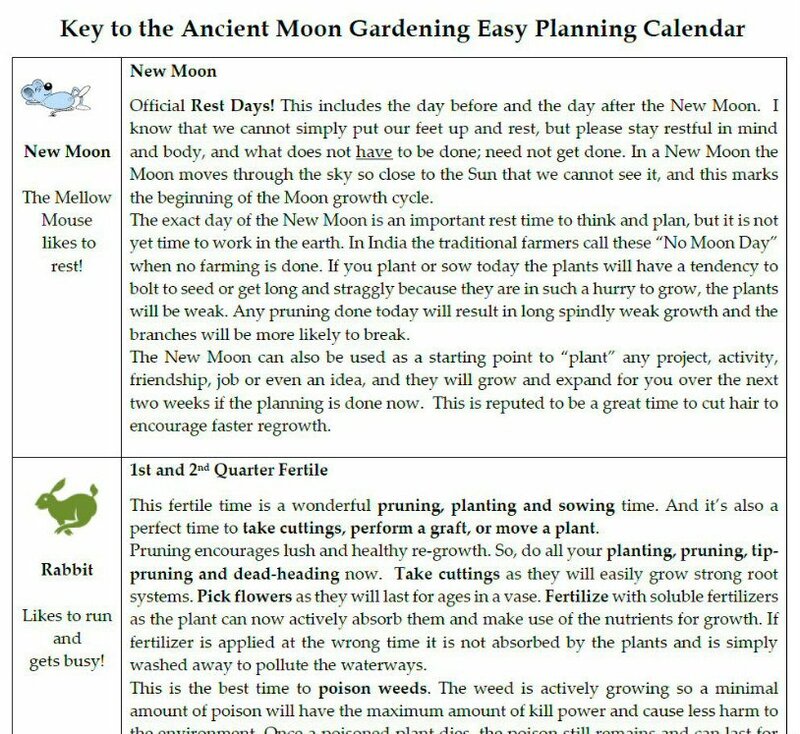 The moon gardening calendar is suitable for Australia and the Southern Hemisphere. Be in Harmony with Mother Nature. Only posted to Australia and New Zealand. Thank you... and may your garden and life be beautiful and abundant. Subscribe to my monthly newsletter, and/or my latest posts. If you're already subscribed and want to change what we send, you'll be sent a link to do so after you click Subscribe. Sun 29° Aries 24' 10"
Moon 03° Scorpio 19' 47"
Mercury 03° Aries 10' 03"
Venus 28° Pisces 53' 37"
Mars 12° Gemini 50' 40"
Saturn 20° Capricorn 25' 55"
Uranus 02° Taurus 20' 39"
Neptune 17° Pisces 42' 26"
Chiron 03° Aries 27' 29"